Consumers look at Samsung Electronics' devices at its D'light Shop in Gangnam, Seoul. Apple and Google are discussing arbitration procedures that could mark the beginning of the end of their long-running war over smartphone patents but Samsung Electronics will not seek a compromise with Apple over their disputes, according to market analysts. 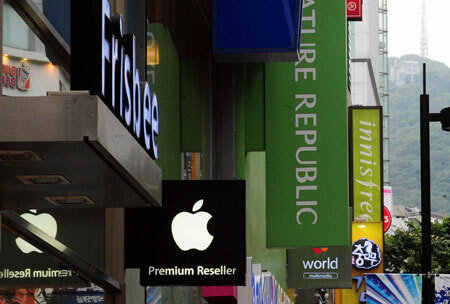 Seoul-based industry analyst Thomas Kang said Thursday that the patent war will continue for the time being. "There is no way Samsung in the current situation will compromise like HTC did considering its market share and its optimistic expansion outlook going forward," Kang said. "As times go by, the situation becomes more and more unfavorable to Apple. Innovations are constantly happening in the mobile industry, and because of that, the innovations led by Apple have disappeared. The value of Apple's patents will lose luster as times go by." He also doubted there could be antitrust issues between the two technology giants because of the nature of the mobile market itself. "Unlike the telecommunications industry led by carriers, the mobile phone market is changing too fast. Samsung owns 65 percent of Korea's market but there are no legal issues of a monopoly as of yet. In the United States, Samsung has 32 percent and Apple 14 percent, and though the two countries' have different legal standards, it is still unlikely that the combined amount will cause problems," said Kang. A smartphone duopoly led by Samsung and Apple has been widening over the past year. Analysts say that the volatile mobile market will threaten their dominance. "It is too late for Samsung and Apple to come to the negotiation table immediately, perhaps only in the long-term or near the end of next year," said HMC Securities analyst Kim Sang-pyo over the phone. One of the key issues in the ongoing dispute, besides claims of Samsung "slavishly copying" Apple products, has been possibility of antitrust law violations. Given the dominance of both firms, can a settlement be reached, and if so, wouldn't the alliance form a duopoly in the lucrative smartphone market? "It depends on how long the duopoly would last: if second-tier players like LG Electronics bring out a mega-hit next year and the market hierarchy shifts, Apple may hold its hands out to Samsung. Samsung will overwhelm Apple next year if things go according to its plan. A truce is likely in the long-term because they would need to check challengers together." added Kim. He said the Korean firm was preparing an additional $1 billion to spend in the legal war. It has increased its target shipment for mobile devices, especially its tablets from 15 million to 40 million for next year. The plan is to more aggressively tap into areas seen as Apple's territory. Despite both firms vocally bashing each other in public, the heart of the matter is purely business, as shown in the settlement between the iPhone maker and HTC. With the right terms, cross-licensing and settlements can happen. By next year, the rise of what one analyst here called the "dark horses" may rise up to force the two technology giants to settle and move forward. By then their alliance won't violate antitrust laws due to second-tier firms eating away at their market shares. The nature of the mobile market will not allow a monopoly. According to Hyundai Securities analyst Baek Jong-seok, the smartphone market will reach the early stages of saturation next year, and the competition will become fiercer and the competitiveness of latecomers will increase. "The 2013 smartphone business, while still a two-way race between Apple and Samsung Electronics, has a high possibility of a dark horse appearing," he said. "The competitiveness of LG Electronics and Huawei may be stressed due to the expansion of demand for low and mid-priced smartphones." He also estimated that next year's market will only grow 22 percent, compared to 76 percent this year.